TAMPA, Fla. - May 31, 2018 - PRLog -- Down & Out Books is pleased to announce that DIRTY BOULEVARD—Crime Fiction Inspired by the Songs of Lou Reed edited by David James Keaton will be published on September 13, 2018 in trade paperback and ebook formats. 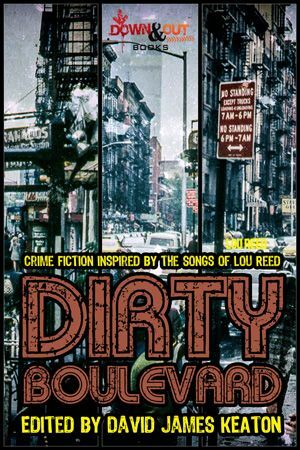 Inspired by the outcasts, outlaws, and other outré inhabitants of rock legend Lou Reed's songbook, Dirty Boulevard traffics in crime fiction that's sometimes velvety and sometimes vicious, but always, absolutely, rock & roll. Inside, you'll find stories from the fire escapes to the underground, stories filled with metal machine music, stories for gender-bending, rule-breaking, mind-blasting midnight revelries and drunken, dangerous, dark nights of the heart. Upcoming genre stars like Alison Gaylin team up with crime fiction legends such as Reed Farrel Coleman, along with Cate Holahan, Gabino Iglesias, Tony McMillen, and many of the most exciting new names in crime and horror fiction, who teach us that a perfect day is often anything but, that the power of positive drinking is a destructive force rarely contained, and that knock-down-drag-out drag queens are probably way tougher than you. Dedicated to the memory and works of Jonathan Ashley. David James Keaton's fiction has appeared in over 100 publications, and his first collection, Fish Bites Cop! Stories to Bash Authorities (Comet Press), was named The Short Story Collection of the Year by This Is Horror. His second collection of short fiction, Stealing Propeller Hats from the Dead (PMMP) received a starred review from Publishers Weekly. His novels The Last Projector (Broken River Books) and Pig Iron (Burnt Bridge) have been optioned for film. Recently, he was the co-editor of the anthology Hard Sentences: Crime Fiction Inspired by Alcatraz (Broken River Books). He teaches composition and creative writing at Santa Clara University in California. He can be found at DavidJamesKeaton.com. In its eighth year as an independent publisher of award-winning literary and crime fiction, Down & Out Books (https://downandoutbooks.com) is based in Tampa, Florida. For more information about the book, to request a review copy of the book, or to inquire about an interview with the editor, contact lance@downandoutbooks.com.